Mullin's World: Sarah Palin, Grassley and Cantor where are you now that you can point out a death panel in action? Sarah Palin, Grassley and Cantor where are you now that you can point out a death panel in action? "The Democrats promise that a government health care system will reduce the cost of health care, but as the economist Thomas Sowell has pointed out, government health care will not reduce the cost; it will simply refuse to pay the cost. And who will suffer the most when they ration care? The sick, the elderly, and the disabled, of course." BREAKING NEWS! There are death panels and one of them is Health America (health insurance company). 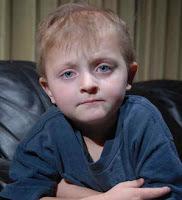 The have denied the life saving medicine to 5 year old Kyler Van Nocker because it costs too much and they say it is experimental. Of course in the past they did approve medicine that was untested. But now they use the excuse that it is experimental. So now that we have a recognizable Death Panel where is Sarah Palin when you need her. Sarah Palin, Grassley and Cantor where are you now that you can point out a death panel in action? Nowhere to be found, because it is an act by a health insurance company whom they support against fictional Obama death panels. They are Conservative dirt bags who don't give a damn for people and their lives. Seniors of America your Conservative Republicans have a health plan, and it is to throw you under the bus. Rep. Paul Ryan (R-WI) the ranking Republican on the budget committee has submitted a plan to eliminate Social Security and Medicare. This plan has support among at least nine Republicans while others are moving way from the proposals but not too far. One of the more vocal supporters is Rep. Michele Bachmann (R-MN). The fact that some Republicans support this proposal is disturbing. The ultra conservative Tea Party will most likely support this as they want government out of their business. If is smells like a racist, talks like a racist,walks like a racist and acts like a racist it is a racist. Former Republican congressman Tom Tancredo at the Tea Party convention has called for a literacy test to vote. He also called for a language requirement to vote. Jim Crow south is back and it is alive and well in the Tea Party. This is a call to move back to the racist past of America. This was used in the 50's in the south to to prevent black Americans from voting. It is clear that the Tea Baggers support this racist attitude and Republican Conservatives have been noticeably silent on this issue, to their shame. To her credit John McCain's daughter, Meghan, has come forward to call it like it is racism and bigotry. Although an issue that Tea Baggers face is many of their numbers may not be able to pass a literacy test, as one needs to be able to read it to pass it, this is not the most intellectual of groups.